Synopsis: Miranda Lovelady, Dr. Bill Brockton's protege, is spending the summer helping excavate a newly discovered chamber beneath the spectacular Palace of the Popes in Avignon, France. There she discovers a stone chest inscribed with a stunning claim: inside lie the bones of none other than Jesus of Nazareth. Faced with a case of unimaginable proportions, Miranda summons Brockton for help proving or refuting the claim. Both scientists are skeptical—after all, fake relics abounded during the Middle Ages—but evidence for authenticity looks strong initially, and soon grows stronger. 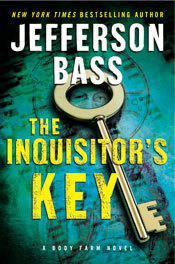 The Inquisitor's Key is my first body farm novel written by new to me author Jefferson Bass. It is an excellent thriller that mixes the historical with the present, the religious with the scientific. I found myself thinking two different people wrote this story because the characters and voices in the past were so much more distinctive than the characters and voices in the present. It all blended together towards the end with a thrilling conclusion and left me wanting to read more Body Farm novels. Sure enough, once I finished the story, discovered Jefferson Bass is a writing team of forensic anthropologist Dr. Bill Bass and journalist author Jon Jefferson. Sometimes it pays to read the back flap author information when you aren't familiar with an author. *grin* Prior to reading the story, I never knew body farms existed. Gross but intriguing all the same. Looking forward to reading more body farm novels by the writing team of Jefferson Bass. Thank you to William Morrow for providing me with a courtesy copy of the book. Not sure this one is for me, but I would love to give this to my aunt, who gobbles up novels like this. Thanks for the great review and for giving me a new title to suggest to her! I have their first book and I thought it sounded great!! Really need to start reading the books on my shelf! !